​1. Set up, focus and align your scope as you normally would with an EP. 2. Slew to a bright star and center it in the EP. 3. Replace the EP with the camera using a C-Mount adapter or focal reducer and re-balance the scope. 4. Attach the power cable and video cable to the back of the camera. If the camera has both S-Video and Composite video connections, you can use whichever you prefer. Or send one to the video capture device and the other to a monitor. An option is to have a small monitor at the scope for focusing and alignment. 5. For remote camera control, attach the hand remote cable or the pc control cable to the remote control connector, either "Auto-Iris" or "Aux" as shown in your camera manual. 6. Provide strain relief for the cables so that they do not come loose or cause problems with mount tracking. 8. If using the computer to control the camera, connect the camera control cable to the RS232 adapter (may need an RS485 to RS232 adapter as well). Then connect the output of the RS232 to one of the USB inputs of the computer. An additional USB cable may be necessary. 10. If desired, a powered USB hub can be used to minimize the number of cables used. It is possible to connect the output of the video capture device and RS232 adapter to the hub and then run a single USB cable from the hub to one of the USB inputs on the computer. The hub can also be used for the mount control cable and the USB output of a guide scope to eliminate two more cables. 11. Next you will want to start your camera control program. 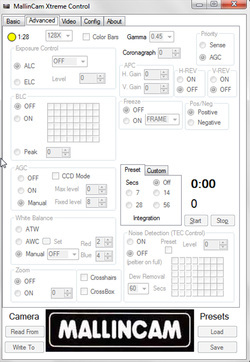 Examples include the various Mallincam Control programs which are available for free on the Mallincam web site, along with Miloslick, which works for most Mallincam cameras, and AstroLive, which works for most of the AVS and MC cameras and can be purchased for $49 and $99, respectively. These will not only allow you to control the camera settings, but will provide an image preview, capture images, stack images on the fly and much, much more. There are other free control programs available from individuals and from the AVS Yahoo Group which provide camera control (including Bluetooth), but not image preview or capture. In these cases, you would also use one of many free image preview and capture programs like Sharpcap, Amcap, etc., to view, capture and/or stack images. I do not intend to go through the details of the various software here. Regardless of the one you use, you will still need to follow some general suggestions for focusing, finding and centering objects of interest. 12. Set the exposure to ~2 seconds, Gain (AGC) to High and Gamma to Low (or 0.3). You will have to consult the software manual to know how to do this. These settings will provide high sensitivity and a fast response which are best for focusing. If the star was properly centered, you should see an out- of-focus star on the monitor. You can adjust the focus knob and watch the image change on the monitor. If the image gets larger, turn the focus knob the other way. A Bahtinov mask is very helpful to get a good focus. Just center the line within the "X" pattern as shown in the picture at left. If you cannot reach focus turning the knob fully in either direction, you may need an extension tube to move the camera further out if you are using a refractor or SCT. For some Newtonians, you may not be able to get the camera close enough to the primary mirror to reach focus. The possible solutions for this are: 1) Use a low profile focuser; 2) Use one of the smaller format cameras which can fit inside a 2" focuser, but be careful it doesn't fall into the secondary mirror; 3) Modify the telescope so that you can move the primary mirror closer to the secondary. 13. Once focused, remove the Bahtinov mask if one is used and slew to a deep sky object of interest. Leave the Gain on high, Gamma on Low and increase the exposure to about 20 seconds. These settings are to help you confirm that the object of interest is centered in the field of view. If not, center it. If it is not visible at all, you may have to do a search by moving the telescope around the general area. The larger the focal length of your system, the more difficult it may be to find and center the object unless your GoTo alignment is very good. Deep sky video is usually performed at a focal ratio of f/5 or lower to give a wider FOV and shorter exposure requirements.